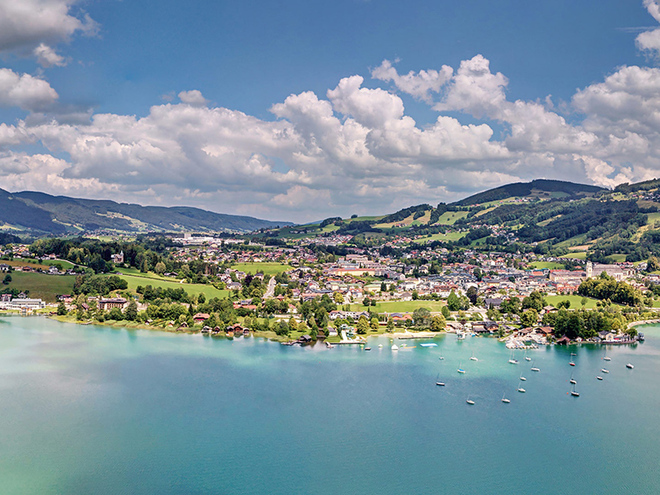 The Mondsee - moonlake in English - offers a wide range of watersport activities. With a length of 11 kilometers an a width of up to 2 kilometers the Mondsee is one of the biggest lakes in the Salzkammergut region. The Mondsee and neighbouring Irrsee are the warmest lakes in the Salzkammergut with water temperatures reaching 27 degrees celcius (81° Fahrenheit). Each year, thousands of guests flock to Mondsee to enjoy the various water sports on offer here - sailing, surfing, kitesurfing, swimming and lots more. According to the legend Duke Odilo went hunting in the Mondsee area with his wife an a large entourage. He unfortunately lost his way and nightfall quickly set in. High up on rocky terrain above the Mondsee he was in great danger and almost fell of the cliffs. The full moon then suddenly appeared from behind the clouds and the duke was able to see the surface of the lake down before him. He was so greatful for being rescued in this way that he vowed to build an abbey on the banks of the lake, wich he named the moon lake (in German: Mondsee).